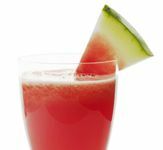 Watermelon is sweet, juicy, low in calories and full of vitamins A and C and potassium. It may not be safe for the dysphagic patient to eat in its natural form as it contains a great deal of water which might cause choking. However, making it into a blended summertime drink then presents it in an acceptable, safe form with the correct viscosity. If you really like, you can add a small measure of your favourite spirit and make it into a cocktail!! Cheers! Scoop out the watermelon and remove the seeds. Place the flesh in a tall blender/liquidiser with the orange juice and ginger. Chill in refrigerator if necessary. Decorate with a wedge of watermelon (if suitable for the dysphagic patient) or sprig of mint. Add a handful of blueberries, cranberries or other soft fruit before blending, especially if thickening is required.